Villages is an indie folk group heavily inspired by the spirit of the Maritimes. However, creating music inspired by their Cape Breton roots seemed like a long shot when the members first started performing together. Back in the late aughts, Matt Ellis, Travis Ellis, Jon Pearo and Archie Rankin formed the indie rock group Mardeen and fled Cape Breton Island for Halifax. Aiming to participate in a music community with a penchant for melodic indie rock, the group strove to carry on the torch of their heroes in Sloan, The Super Friendz and Thrush Hermit. After releasing several acclaimed albums and EP’s, there was a turning point in that endeavour. “One late night, a few years back, a singalong of Rankin Family tunes broke out” says vocalist Matt Ellis. “I remember saying to the rest of the band that we need to write something that evokes the sound of home.” Soon after that night, Ellis wrote just that song. It was called “Hymn After Hymn” and it captured the Maritimes musically and lyrically in a new and authentic way. This song was followed by a burst of creative output and the group quickly jumped into the studio to record these songs with east coast stalwart and producer Joel Plaskett. “Joel has such a strong knowledge of folk music from the UK and Ireland, he really brought our songs to life”. The problem was, these new songs had nothing in common with the edgy indie rock that Mardeen is known for. These songs needed their own home. Inspired by an essay that comic artist Kate Beaton wrote about her hometown in Cape Breton, the project was named Villages. The group released their first single in October 2016 and have been writing, recording, and touring in the time since. In February 2019, Villages will release their self-titled debut album. 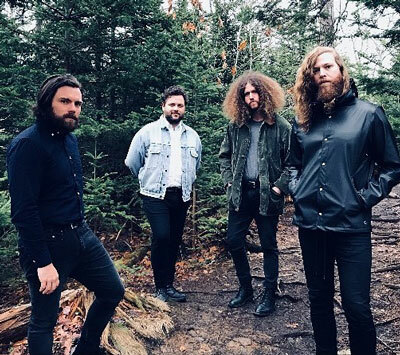 Recorded at their home studio in rural Nova Scotia with producer Thomas Stajcer (Joel Plaskett, Erin Costello), and mixed by Kevin Ratterman (My Morning Jacket, Basia Bulat), Villages solidifies the group’s vision in capturing the spirit of the Maritimes in a fresh, yet familiar way. Combining Celtic and British folk music influences with the atmospheric arrangements of groups like the War on Drugs and Fleet Foxes, Villages’ debut record is just the first step of a journey into rediscovery and reinvention.